Blackleg (shown above) is more serious this year in some fields, largely due to good early season conditions for infection. Pre-swathing is a good time to clip plants and scout. Some growers are dealing with high levels of green seed this year. High green, along with high heat and dockage, can increase the storage risk. One of these is sclerotina and one is blackleg. Can you tell them apart? High levels of blackleg have been found in some canola fields this year. Quite likely blackleg was present the last time canola was grown on these fields but went undetected based on a lack of obvious yield losses. 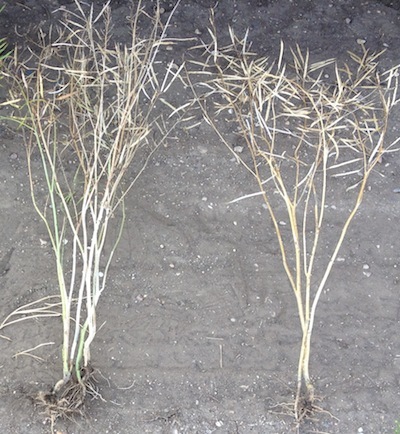 Just before or while swathing are the best times to check plants for blackleg and other diseases. Uninfected parts of the plant still have some green colour, making discoloration due to disease infection easier to see. 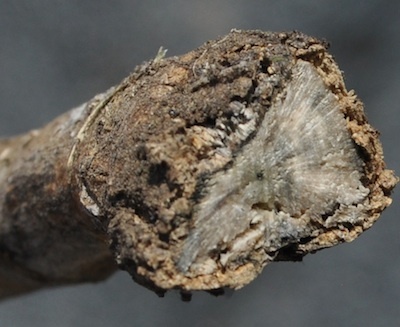 Read more for blackleg identification tips and helpful photos. Canola needs to move back up to 20% moisture and temperatures need to be 15 C or warmer before enzymes to reduce chlorophyll will restart and function effectively. Growers with high green canola in the swath have time to wait, if they choose, to see if these necessary rains come along. Weed seeds tend to contain more moisture than canola seeds, especially if they are green or immature. If these weed seeds congregate in pockets in the bin they can create localized hot spot for spoilage to begin — especially if that canola is also binned hot. Green canola seeds can also increase the storage risk, even if canola is dry and cool. Monitor closely. Canola growers can lose up to 5 bushels or more per acre if the combine isn’t adjusted properly. This article includes tips on how to measure combine losses. If losses are too high, growers can lower them by adjusting fan speed and sieves, for example, and by slowing down the whole combine operation.